The St. Thomas University Sports Wall of Fame induction class of 2017 all had one thing in common—an appreciation for the bonds that were formed during their time as a Tommie. 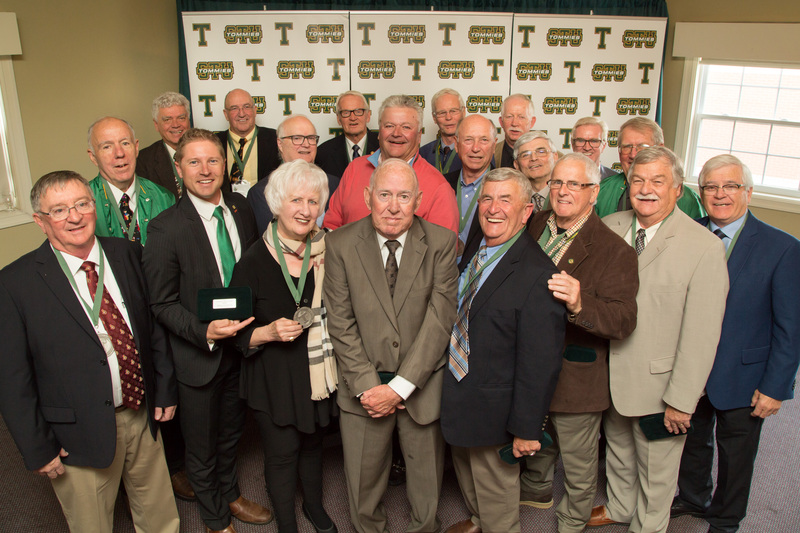 Mary Lou (Wolstenholme) Foreman, Nicole (Badry) Holubowich, William McMullin, Greg Morris, and the 1966-1967 men’s hockey team were officially added to the STU Sports Wall of Fame and are now a permanent and celebrated part of the university’s athletic history. “Our inductees stretch back to over seven decades of athletic achievement,” President and Vice-Chancellor Dawn Russell said. Foreman, who came to St. Thomas in 1962 and was a pioneer in the evolution of women’s sports at the university, said she found exactly what she was looking for as a Tommie. “This small community and St. Thomas offered me exactly what I wanted – a comprehensive liberal arts program and the opportunity to pursue my love for sports,” she said. The women’s teams she was a part of didn’t win any championships, but the results on the scoreboard were not the most important part of Foreman’s experience. “I don’t remember that we weren’t very good, but here’s what I do remember: we had spirit. We had resolve. We were a family. We had one another’s backs,” she said. In her final year at St. Thomas, Foreman was the first female athlete to receive the university’s Silver Medal for her participation in three varsity sports. McMullin, who came to STU in 1952, was a star hockey and football player. The two-sport athlete was a member of the football team that earned the New Brunswick Canadian Rugby Football Union title and was known as a playmaker and pure scorer on the ice. Arriving on campus 65 years ago was overwhelming for McMullin, but he credits his teammates—who became family—for making it easier. Guy White, who spoke on behalf of the 1966-1967 men’s hockey team, echoed McMullin’s sentiment. “I came to STU as a teenager from Kingston, ON, and quickly learned being part of this team would be something special,” he said. The Tommies were special on the ice as well, coming back from a 3-2 deficit to defeat Mount Allison before going on to capture the New Brunswick Hockey Championship with a 4-1 win over the Universite de Moncton. With the win, the Tommies earned the right to represent the province at the first-ever Canada Winter Games. “Our success was a direct reflection of our commitment to St. Thomas, to the sport, and to each other,” he said. Holubowich, a cross country standout, wasn’t able to attend the induction ceremony but sent comments that were read by Athletics Director Mike Eagles. The two-time ACAA Cross Country individual champion and MVP said competing as a Tommie enriched her time as a student and impacted her personal development. With this year’s induction class, the STU Sports Wall of Fame has honoured 31 individuals and 11 teams.